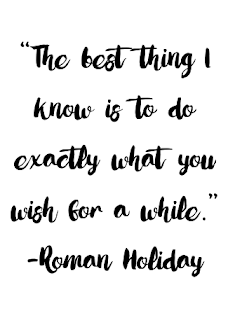 When was the last time you did something simply because you wanted to? Not because you had to. Not because you felt obligated to. Simply because you wanted to. I feel like the majority of you will agree it has been a long time. We all have many obligations and trying to find free time in between can be difficult. I think self care is very important. Sometimes the best way to take care of yourself is to take some time and do exactly what you want. 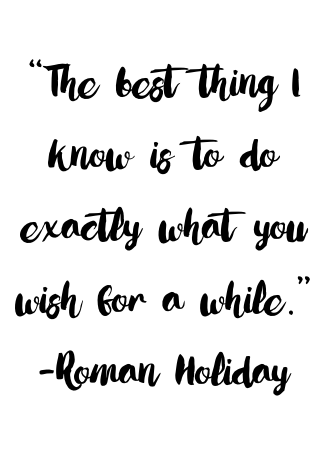 Unless you run away like Princess Ann in Roman Holiday you probably aren't going to have a whole day to do whatever you wish. Let's start small and find some time to do at least one thing you want this week. Get some ice cream, see a movie, get your hair done, go for a vespa ride! Find something you can fit into your schedule and do it.